After the first two pages, I admit, I was worried. Over-dramatic, stereotypical imagery: a helpless, pursued heroine, a moonlit night, bloody hands, steep cliffs. I persevered with faith in my fellow reviewers, and discovered the campy beginning was only a scene from Chrysanda Flamande’s latest movie, “Kiss of Darkness.” Her sister-in-law, Norah, and she are at the movie’s premiere when an elderly Chinese man tries to get their attention “about a matter of life and death.” Pushed off as yet another admirer, it is the first in a series of strange events that have Norah worried. The first edition of this book has a 50′s pulp cover, terribly misleading to both the story and writing style. Past president of the SciFi Fantasy Writers of America, multiple Locus award nominee and Nebula winner, Hambly is a highly skilled and successful writer. Her bibliography ranges from epic other-world fantasy to Star Wars and Star Trek novels to historical mysteries to historical fiction, but nothing in her writing comes close to the fast and loose sensation-focused writing of pulp magazines. 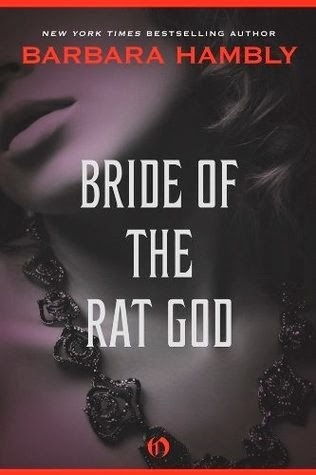 Bride combines her best: a lavish historical setting with a disconcerting mystery of supernatural origins. I loved the beautiful, eerie atmosphere, Hollywood in the 1920s, the characterization, the plot–it is almost easier to say what I didn’t like. This is a book I’ll be re-reading. The summary: Widowed in the war, Norah has come to L.A. from England at the request of her sister-in-law, Christine, lead actress for Colossus Studios. Christine is mistress of Frank Brown, the studio owner who is under heavy pressure to buy out another studio–or be bought out himself. Besides being Christine’s companion, one of Norah’s jobs is taking care Christine’s three Pekingese dogs. In true Hollywood fashion, they go everywhere with her, even to the movie set. A multi-thread plot line explores the movie-star lifestyle of Christine/Chrysanda, filming the latest movie, a mysterious elderly Chinese man that seems to be following them and Norah’s feelings of loss and growing attraction to Alec the cameraman. Hambly skillfully builds a sense of tension and supernatural influence from the beginning. Characters were a high point for me. Although I was slightly overwhelmed with names in the beginning, it soon sorted out. For the most part, all the characters felt multi-dimensional. The Big Bad Evil developed, mysterious at first and then gradually more present. Special note should be made of the wonderful, realistic description of the three dogs who play an important role in the plot–Black Jasmine (with one eye), Chang Ming and Buttercreme (the princess). It was no surprise to read the afterward and learn that Hambly has four Pekingese dogs. She’s able to capture the sense of three different dog personalities without excessive anthropomorphizing their behavior. Hambly struck the perfect balance in characterization. Although Christine runs the risk of being a stereotypical star, dramatic and self-centered, her clear affection for Norah and rough upbringing save her from being completely unlikable and ridiculous. In many ways, she becomes the supporting character to Norah’s story. Likewise, though Norah could have been a facile stereotype of the dowdy, downtrodden lady’s maid, she actually has a good deal of influence and determination in her own life as well as Christine’s. She and Christine are often more like partners in crime, particularly when thwarting unwanted admirers. One of the challenges in writing a period piece is acknowledging the racism and sexism in a way that is consistent without completely alienating the modern reader. Without being too spoilery, the artifact that begins the trouble in this story belongs to a demon/god of the Manchu tribe, who was then worshipped in secret after the Manchu took control of the Chinese empire. To me, Hambly acknowledged much of the racism in the 20s in the way the Western characters interacted with various Chinese people, but without engaging in the worst offenses. One clever way this is dealt with is through Christine’s ‘love’ of all things Chinese–although she is confused by Chinese history and why Chinatown “doesn’t have those decorative round gates.” It emphasizes the appropriation of the ‘exotic’ without any real understanding or appreciation. The plot ends up being rather straightforward, with most of the tension developing as characters gradually recognize and then manage their danger. Hambly keeps events moving, from the beginning movie premiere, to an after party in a cafe/bootlegger’s, to Christine and Norah’s hillside home. It doesn’t take long before a murder occurs and an actor goes missing. Production is whisked off to the desert, partly to escape the press and the rumors, and partly due to script. I have a quibble or two, which I suspect can be blamed on the Kindle edition. There’s a few rough transitions where I didn’t realize we changed scenes or speakers. I suspect that might have been better understood by visual separation in a paper version, and the Kindle ruined the formatting. Although I don’t usually notice it, there was a misspelling or two in the Kindle as well. On the other side, I enjoyed Hambly’s afterward and note on her dogs. I honestly don’t think I have any other quibbles. Overall, an immensely satisfying read that went down in a couple of days. For the life of me, I can’t figure out why it came to my attention, but when I recognized the title on a Kindle special, I snapped it up. Thankfully, I can now re-read to my heart’s content without angering the Librarian Gods.